There was a time when West Van was a place that I would frequent. You see, Rich Guy lived up in the British Properties and his place would be a meeting place of sorts for everyone. And why not really, the house was large complete with an indoor swimming pool, sauna and pool table. Ah... The life of a Rich Guy... Now that he has moved, West Van has become a forgotten place of sorts for us. We are rarely out there other than passing by on our way to Whistler. Even when we're somewhat close by (after our hockey game in North Van), we can't even eat here due to the fact everything closes so darn early. 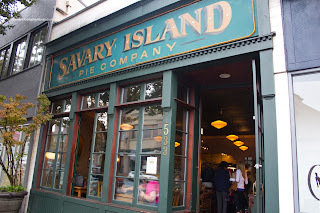 Last time I was in the area, I really wanted to give Savary Island Pie Company a go, but the lineup stretched out the door. And you know my love for lineups... So it hasn't been up until now that I had my chance. Mijune was free to meet me for lunch and we had originally wanted to head to the new Pinkberry location in West Van. We never made it there because we paid a visit to Savary Island first and never left (something about Mijune and sweets...). We got a couple of things to share starting with the Grilled Chicken & Basil Sandwich. Gawd this thing was buttery. From the buttered bread and mayo to the pesto, it was artery-clogging goodness. Large hits of basil thanks to the green onion pesto and whole basil leaves sandwiched in between moist chicken breast slices, tomato and lots of pepper. This was one fine sandwich and would've been perfect if it weren't so salty. 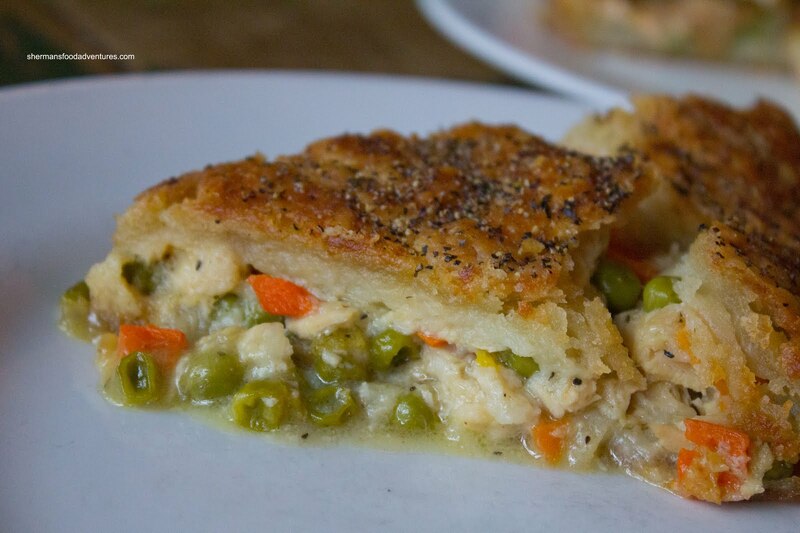 We also got a slice of the Chicken Pot Pie and despite its modest portion size, it was satisfying. The crust was rich and buttery while the filling was equally rich with moist chicken, peas, carrots and potatoes. I found the flavours in this pot pie to be well-balanced. I didn't feel the need to add more pepper, salt or anything else. Arriving on the same plate as the pot pie was a cup of Split Pea and Ham Soup. At first, we were trying to figure out what was different about this soup and it was due to the addition of dill. Although it gave the soup some character, I thought the dill didn't really go. 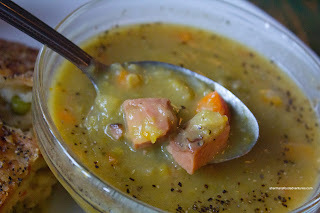 In addition, the soup itself needed more salty-smokiness from the ham. It was a bit flat. What I did like was the chunkiness of the ingredients. Personally, I like this more than the smooth version. For our second slice of pie, we had the Lemon Buttermilk with berries. The best way to describe both the texture and flavour would be to call this a lemon cheesecake flan (with a poorly made flan). Now I'm not dissing the pie because it wasn't a flan; but the texture was that of a badly made flan. In this case, it didn't matter because we liked it. It was smooth and creamy. The flavour was very similiar to a lemon cheese cake which suited me just fine. 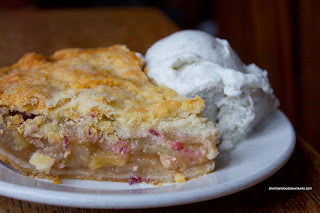 I really liked this slice of pie. As if this wasn't enough sweets already (since I'm not really a dessert guy), Mijune walked back up to the counter and ordered 4 more items! We tried the Cranberry Orange Pecan Muffin first and it was fantastic. 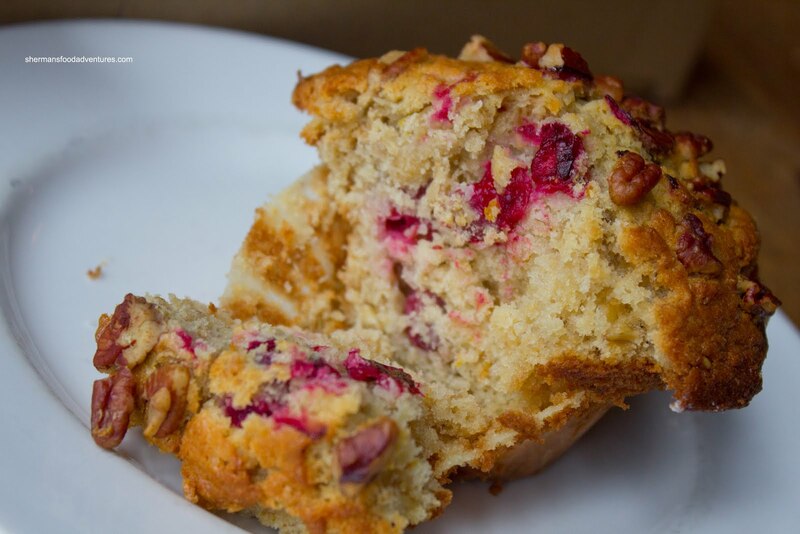 Once we got past the huge crispy muffin top, it reveal a moist semi-sweet center that was bursting with hits of orange and cranberry. Definitely a good deal of zing which acted as a good balance to the sweetness. 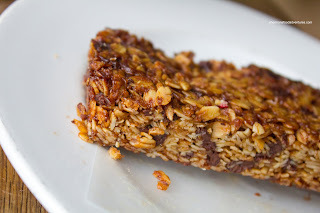 The crunchy pecans on top were a great textural contrast. Moving along, we sampled the large slice of Carrot Cake next. 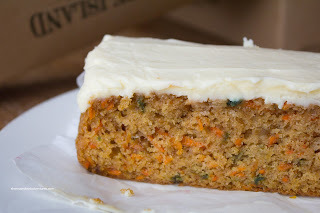 It was super moist with lots of carrot and intermittent chunks of apricot. At first we thought the green bits in the cake were zucchini. Upon further inspection and inquisition, it was actually carrot. With some research, we found out it could be due to the use of organic carrots which react to baking soda and could make it turn green. Now this is just speculation. We weren't exactly sure why the carrots turned partially green. Whatever the case, the cake was good and the cream cheese icing on top was perfect. It was super smooth and creamy while not being too s weet. Yum. By now, I was in a food coma; yet there was still more to sample. 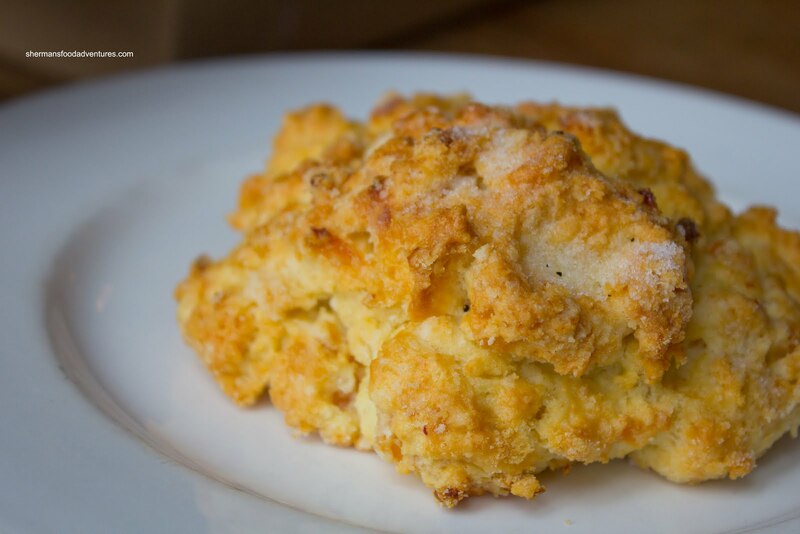 We moved onto the Apricot Almond Scone which looked great visually. Too bad the scone itself was a bit too dry. I suppose if we slathered it with butter or jam, it would've been better; however, I was either too lazy or too full to go through that trouble. I did like the crunch of the exterior and hits of sweet apricot though. 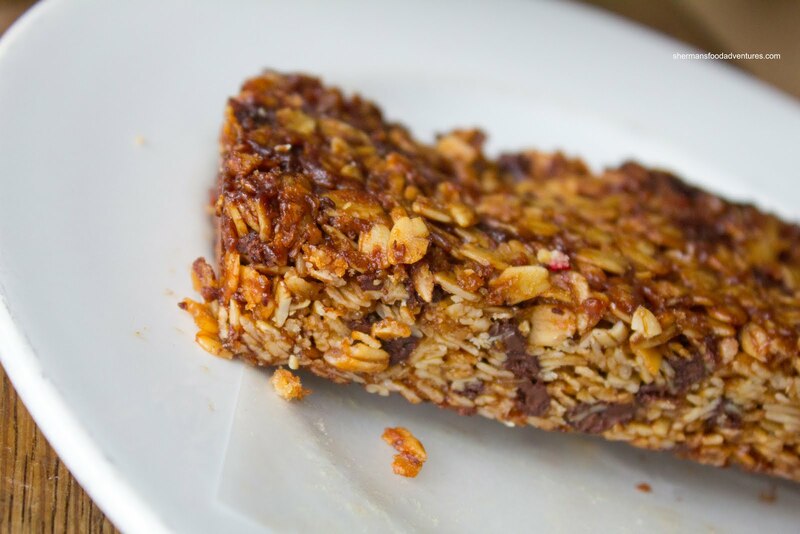 Lastly, we had the Chocolate Granola Bar. This thing was pretty huge, barely fitting onto the plate. It was chock full of chocolate chips while having a nice balance between being chewy and slightly crunchy. Due to the high chocolate content, the bar was rather sweet though. In the end, Mijune and I thought it was well worth the drive out to West Van for Savary Island. The place is quaint and has got that eclectic feel (a la Portland) to it. It is quite apparent that they take real care in their food and really know how to bake. Only problem is the place is small and it gets busy. Not good for people who hate lineups; but it is a good indication there is something good happening here. Sherman, you've discovered my favourite place for pie. I love their pies and will drive all the way there to get me some (easy to rationalize on a sunny day). Besides pie, they make the best soda bread. It's moist and dense, even after a few days. I'm craving some now. 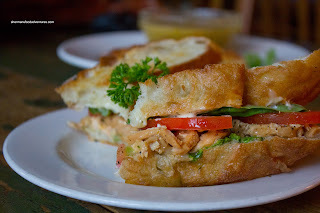 Their chicken salad on cranberry bread is also to die for but it's kinda small. As further incentive to make the drive, Pinkberry has arrived at the Village! Unfortunately, there's usually a line up. But if you want a variety of yogurt flavours like, watermelon, coconut, pomegrenate, or mango, this is the place to go. Flavours rotate so you get different ones each time. Also, for a small additional price, you get all the toppings you can fit on your cup. @Holly Hehe... Yes, it is definitely worth the drive. At least this time, I didn't have to lineup! We were going to go to Pinkberry but we were too full! We usually get takeout which allows us to (somewhat) avoid the crowds. 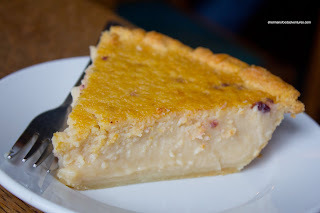 The lemon pie looks fantastic though...I'll have to try it the next time I'm there!